This Thermoelectric Generator–Solar Hybrid power system is designed to provide DC power for operation of the supplied loads on the wellhead platform. The TEGs are connected together in a parallel configuration to produce the desired 24 VDC electrical output at 20ºC. Division 2-rated Charge Controller Unit. 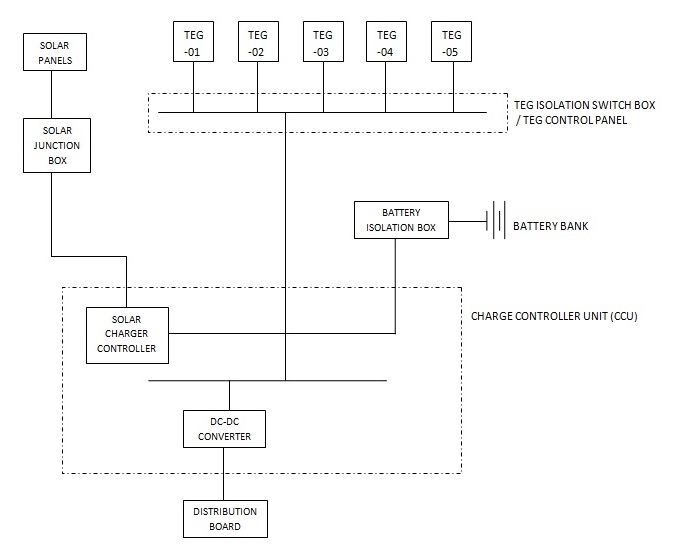 Connected in parallel is a battery bank designed to provide the necessary autonomy for the customer’s DC loads. 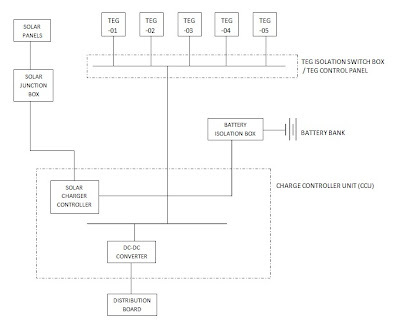 24 V solar panels are wired to the Charge Controller Unit (CCU), and connect in parallel through a solar charge controller in the CCU, to the TEGs and battery bank. The fuel supply for the thermoelectric generators flows through a Fuel Conditioning System (FCS). The FCS removes solids and liquids from the fuel stream that could affect the performance of the TEG. Included on each TEG are two 4-20 mA signal conditioners that report the voltage and current output from each TEG unit to a SCADA monitoring system supplied by the customer. The TEG Isolation Switch Box and TEG Control Panel is used to house the interconnection of the thermoelectric generator power and signal outputs to the remainder of the system. The Isolation Switch box contains isolation breakers and an Output Breaker. The TEG Isolation Breakers allow each of the TEGs to be electrically isolated from each other and the system. The Output Breaker controls the power of the parallel-connected TEGs to the Charge Controller Unit. The Ignition Power Isolation Breaker is included in the Isolation Switch Junction Box. This breaker acts as the main circuit interrupter for the external 24 VDC power supplied from the CCU to the spark ignition circuit within each of the five TEGs. Secondary circuit protection for each TEG spark ignition circuit is provided by the five 2-amp Ex-d rated fuses in the Isolation Switch Junction Box. The TEG Control Panel provides interconnection terminals to connect the voltage and current readings and status alarm signal from each of the TEGs to the SCADA system. The Charge Controller Unit serves as the main connection and distribution point for the TEG system power, solar system power, battery system power and customer loads. All circuits are housed in an enclosure certified for use within a hazardous area environment and have the necessary Ex and IP ratings. The TEG Power Isolation Breaker protects the power circuit from over current and allows the TEG system to be disconnected. When the TEG system is disconnected, the customer load is powered by the battery or solar power sources and TEG ignition and monitoring circuits are powered from the System Bus. The Solar Charger Controller provides power on demand if solar power from the solar panel array is present. During the time of sufficient solar radiation, it is able to supply both customer load and battery charge current. The Solar Charger Controller automatically adjusts output voltage and current depending on available power, load power demand and battery charge condition. The charging voltage and current set points are adjustable. The battery system is intended to be a back up source of power in case of failure or unavailability of TEG or solar sources. For that reason the battery is being continuously charged when TEG or solar sources of power are available. For the normal working condition of the system, the TEG system is acting in float charging mode providing power for customer load and continuously charging the battery. To provide that charging mode, the TEG system is set at a pre-set V output voltage, which is the Battery manufacturer’s recommended float charge voltage. The solar system acts in two charging modes: boost charge and float charge. The controller chooses the charging mode automatically, depending on battery charge state. Depending on project specifications, the power system output voltage is sometimes required to at the 24.0 V ± 5% range. The DC-DC Converter modules are used between the System Bus and the System Output to comply with the output voltage range requirement. The DC-DC Converter Array has been designed to supply the nominal output power and consists of integrated DC-DC converter base modules, in an N+1 configuration with an interface board that includes noise and voltage suppression circuits on it. The converter acts as voltage regulator providing stable output voltage with wide range of input voltage from 24 V to 32 V.
The output voltage of the converter is adjustable and is factory preset. The output voltage is adjusted using the 10-turn potentiometer located on the module board. The converter array also includes a common alarm function with a single dry contact terminal that indicates a malfunction of any of the modules. This signal is available in the SCADA terminal bank. SCADA signals for system control and monitoring consist of digital (dry contact) signals, and analog signals. The digital signals are described in the following table. The analog signals (4 – 20 mA) are described in the following table. The signal conditioners sense the required voltage or mV signals at the specified terminals or shunts in the Charge Controller Unit. The signal conditioner then converts the signal reading into a 4 to 20 mA current output. The signal conditioners have been setup and calibrated according to the specified signal input range. A battery bank is included in the system to provide backup power in the event the thermoelectric power system is off line or unable to supply the power demand. This battery is sized and tested to provide a load, connected to the output of the Charge Controller Unit at 24 volts for the desired autonomy. The cells are housed in a Ex rated enclosure. Depending on fuel gas quality the FCS components can vary. Where fuel gas needs more intensive filtration an (FCS) can consist of a particulate filter, a coalescing filter, a CO2 filter and knock-out vessel to remove solids and liquids from the fuel stream. From the particulate filter, the gas flows into the liquid knock out vessel that removes any free liquids from the gas stream. The auto-drain trap controls the liquid level in the knock out vessel with a high liquid level switch that provides an alarm signal in the event that the liquid level rises in the knock-out vessel. From the knockout vessel the fuel gas flows to a Finite coalescing filter with auto-drain. This filter is equipped with a 0.01-micron rated filter element and is designed to catch any liquid that may be carried over from the knock vessel. Connected to the drain header, the auto-drain ensures stripped liquids do not collect in the coalescing filter. The final element in fuel conditioning system is the CO2 filter. This polyimide membrane filter separates the CO2 gas component from the fuel gas stream ensuring a constant energy value of the gas being supplied to the thermoelectric generator. Varying energy values will affect the performance of the TEG and could result in damage to the power unit. A stainless housing protects the replaceable filter element.